Help Eliras with a contract. You start with Mine Cart in your hand. Mine Depths: Creatures can't be summoned here, except by card abilities. Each turn, a player gains 1 magicka for each creature they have here. 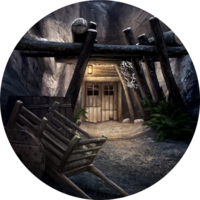 Abandoned Mine is a location in Falkreath and is one of the initially available locations in A Traitor in our Midst. This match features a Mine Depths lane: "Creatures can't be summoned here, except by card abilities. Each turn, a player gains 1 magicka for each creature they have here." You will be given one Mine Cart in your hand in addition to your starting three cards. Unlocking Falkreath Sanctuary requires completing all three of the initial locations in this episode. Eliras: "You want to help in this assassination? Very well. We're after an Orc bandit holed up in this mine. Try to be useful, eh?" "Use the mine cart to reach the depths of the mine." Eliras: "Watch out around the other brothers; they can't all be trusted. I caught a glimpse of someone sneaking around the Sanctuary last night. It was dark, but I could tell they had red eyes." 1 Intimidate Action 1 – – 2 Rare Enemy creatures lose Guard. 2 Shadow Shift Action 1 – – 1 Common Move a friendly creature. 2 Mighty Ally Creature (Nord) 3 3 3 1 Common Summon: +3/+0 and Breakthrough if the top card of your deck is . 2 Stone Throw Action 3 – – 1 Common Destroy an enemy creature if you have a creature with higher power. 2 Alik'r Survivalist Creature (Redguard) 4 3 4 3 Epic Summon: Put a Steel Dagger into your hand. 2 Bandit Ambush Action 5 – – 3 Epic Summon two 1/1 Cruel Bandits in each lane. 1 Unstoppable Rage Action 8 – – 3 Epic A friendly creature deals damage equal to its power to all other creatures in its lane. 3 Shadow Shift Action 1 – – 1 Common Move a friendly creature. 3 Orc Clan Captain Creature (Orc) 2 2 2 2 Rare Other friendly creatures in this lane have +1/+0. 3 Thieves Guild Recruit Creature (Argonian) 2 1 2 1 Common Summon: Draw a card. If it costs 7 or more, reduce its cost by 1. 3 Dune Smuggler Creature (Khajiit) 3 3 1 2 Rare Summon: Move another friendly creature in this lane. 3 Stone Throw Action 3 – – 1 Common Destroy an enemy creature if you have a creature with higher power. 3 Earthbone Spinner Creature (Wood Elf) 4 3 2 3 Epic Summon: Silence another creature, then deal 1 damage to it. 1 Wild Beastcaller Creature (Spriggan) 6 3 4 3 Epic Summon: Summon a random Animal. 1 Spider Daedra Creature (Daedra) 8 4 2 4 Legendary Summon: Fill your lanes with 2/1 Spiderlings. 1 Nest of Vipers Action 10 – – 4 Legendary Fill a lane with Territorial Vipers. This page was last modified on 30 July 2018, at 13:25.